Carrot contains beta-carotene, a strong antioxidant that can prevent cancer. Regular consumption of carrots reduces cholesterol level which helps prevent heart related problems. Since carrots have vitamin A, it is said to be good for eye sight also. Including carrots in your diet makes the skin softer and smoother.Thus carrot in its cooked form or raw, is good for your health. Today let us learn how to make this simple carrot rice following our easy recipe. Heat a tsp of oil and fry all the above ingredients, adding coconut at the end. Powder it and keep it aside. Cook 1 cup of rice with 2 cups of water so that each grains are separate. Keep aside. Heat oil in a pan , add whole garam masala followed by mustard seeds, when mustard splutters, add channa dal, urad dal and curry leaves. Add onions and sauté until it becomes translucent. Then add grated carrots and cook for a few minutes until the raw flavor goes. Do not overcook. Add the ground masala powder, required salt and mix it well. Now add the cooked rice, roasted peanut powder and mix everything well gently. Serve it with raita or chips or papads or any gravy of your choice. Thats a very lovely recipe and ofcourse very creative display!! !The mermaid lookd so cute!Thanks for sending it to the event. Wowww Padhu, wat a cute presentation, carrot rice is always our family favourite, u have loads of patience dear to present ur dishes..
Wow...Padhu...!Can't take my eyes from your creative click. Simply Awesome.....Gr8 Work Yaar !! Hats off 2 ur creativity !! padhu, another creative work of art from your kitchen. 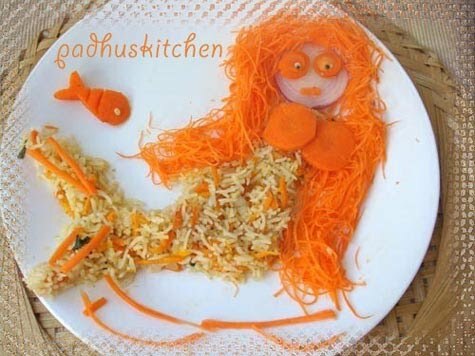 kudos to you..
Lovely recipe and beautiful mermaid rice..
Oh carrot rice in the form of little mermaid, which little child won't eat that! வாவ்வ்வ் சூப்பர்ர் ப்ரெசண்டேஷன்!! ரெசிபி மிக அருமை!! Wow! your presentation looks very good, very artistic work with food. Lovely.I prepare this carrot rice and follow Mallika Badrinath's cookbook. ohwwoow..cute presentation padhu, rice looks yummy..
That is so cute....love the quick idea of a carrot rice! Carrot mermaide has lot of thick curly hair. Love it. cute carrot fish too. Nice rice. hey the mermaid looks so cute..love the rice and so the presentation. wwoow..cute presentation padhu, rice looks yummy. Wow.. cute and lovely presentation,yummy rice. padhu what a beautiful lady fish..really delicious and yummy.. carrot is always healhty.. loved this rice version.. Carrot rice mermaid..... Kids are going to love it.... Thank you for the idea and for the recipe. wow...luved the mermaid..specially her orange hairs...and i too made carrot rice but tried and tasted frm divya's dilse..will post soon..ur version is quite different..will try someday..
Love ur creativity. Its always at its best! The presentation looks very cute. even my Mom makes a Dry masala powder for this rice, i think she adds some pepper. Very beautifully and creatively presented the dish. Looks delicious, colourful and tempting. Evey time i visit your blog... i get a surprise...this time... a pleasant shock...Padhu your presentations are simply wonderful...particularly this one is very attractive.your mermaid has mesmerized me...keep it up.what's next? Very creative, kids will love to eat this. என் பிளக் பக்கம் தொடர்ந்து வந்து கமெண்ட் போடுவதற்கும் மிக்க நன்றி. ஊருக்கு செல்கீறேன் வந்ததும் அடிக்கடி வருகிரேன். அருமைய்யான கேரட் சாதம் சூப்பர் பிரசண்டேஷன். very nice.presentation is really different. LOL! That's an attractive mermaid! The carrot rice is yum! Great rice, but even greater presentation! How cute! Hats off to your food presentation!!! Healthy Recipe, your presentation is unique. Beautiful mermaid never thought rice cd be presented so beautifully ! !will def try to present it like this!!! All your recipes are winning appreciations at my home...thanks a ton...this one carrot rice ,planning for tomorrow....I know it will rock. Made this yesterday and we loved it. Skipped the peanut powder as my daughter is allergic to them. Love all your rice dishes as they are so flavorful and yet simple ! Thanks for this healthy recipe ! Presentation superb... Can u pls suggest which gravy suits to this?? Thanks suma. Raitha, papads, potato chips, potato fry, papadams will all go well with this. You can try dry paneer sabji also. Hi Padhu, I tried this recipe today without peanuts. It came out well and tasted very good. It was a simple to make as well. And yes! also very creative presentation by you.